I don’t enjoy sewing for others. That’s a fact. I don’t really know why, and I’d love to be able to rejoice in it. But I don’t. Sewing for others makes me feel frustrated and in that case it becomes more chore than pleasure. There’s one exception, though: Sewing for my toddler nieces. Again, I’m not sure why. I guess it’s because you can go wild with ideas and also fitting isn’t as big an issue as with adults. Toddlers aren’t that hard to please when it comes to new dresses. They can be as crazy, loud and colourful as you like and they’ll love it! It’s also a great way to use up larger fabric scraps and try out combinations you wouldn’t be able to pull off yourself. Last year I made a bunch of dresses, jumpers and a jacket for my oldest niece, who is 2.5 years old. I completely forgot to post these, as I mostly blog about things I make for myself. But I’m quite proud of them and they are too cute not to be shared. 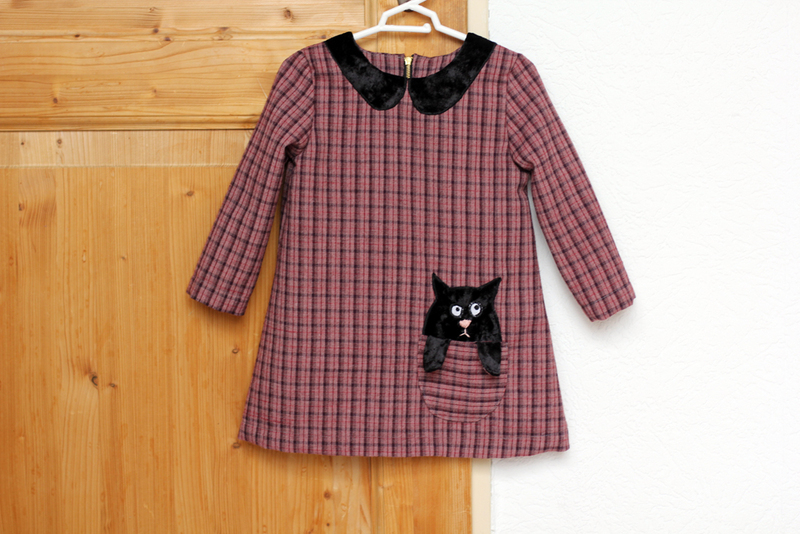 So here’s the first one: A boiled-wool tartan and velvet dress with a fake Peter Pan collar and a grumpy kitten pocket. Such a great little project to try my hand at appliqué (using the satin stitch setting and fusible interfacing) and simple hand-embroidery for the nose and mouth. 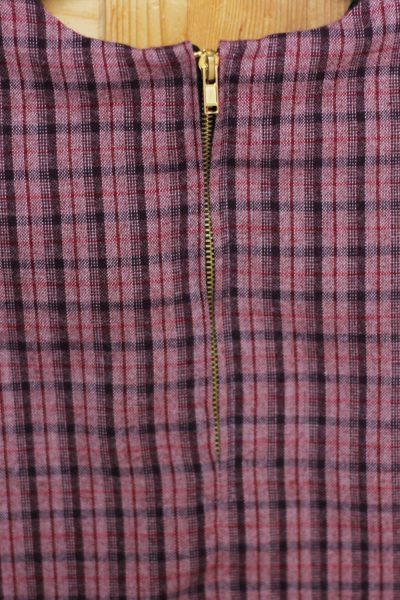 I also tried a different technique for inserting an exposed zip. 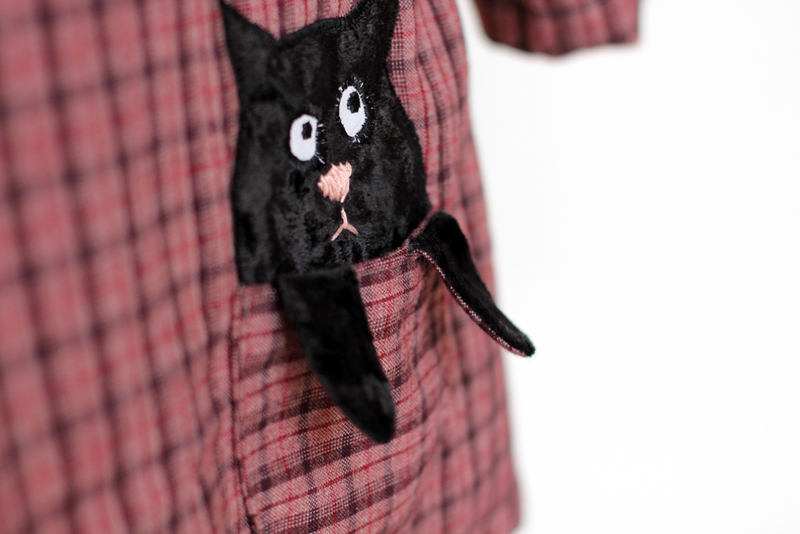 And, of course, the pocket is fully functional. Toddlers need pockets! How did I make the kitten appliqué? I made a little drawing and created a paper pattern from that. I cut out the velvet (recycling an old velvet top) and interfaced it. 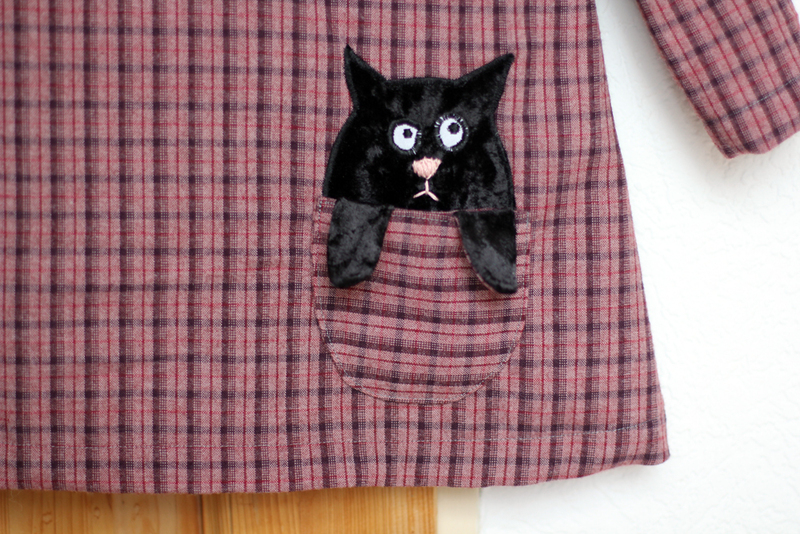 I sewed on the eyes by machine and the pink nose and mouth by hand, using embroidery thread. 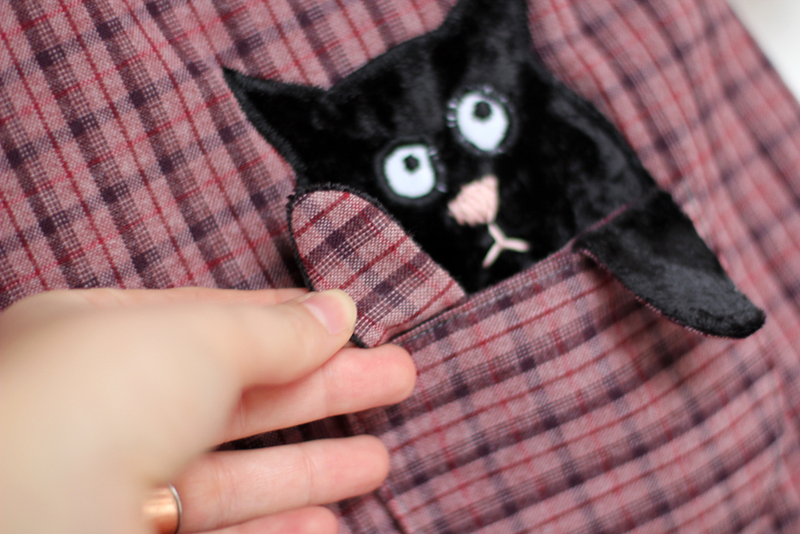 I appliqued the kitten to the front of the dress using the same satin stitch I used for the eyes. 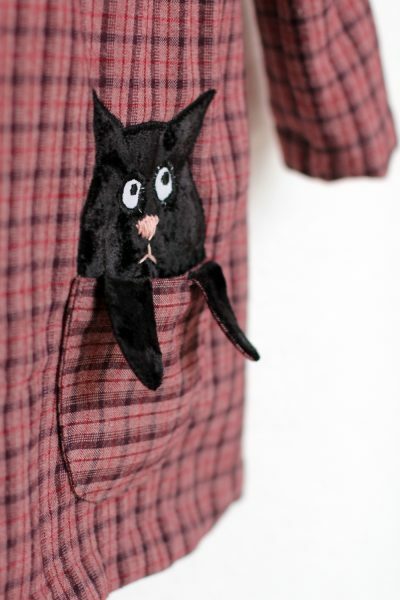 The bottom of the cat which you can’t see fills out the whole of the pocket, so you can’t see “where the cat ends” when you peek into the pocket. To create the paws, I cut two pocket pieces and pinned the paws in between before stitching them together, as you can see in the picture above. The paws are lined with wool, as the velvet alone would’ve stretched out of shape. 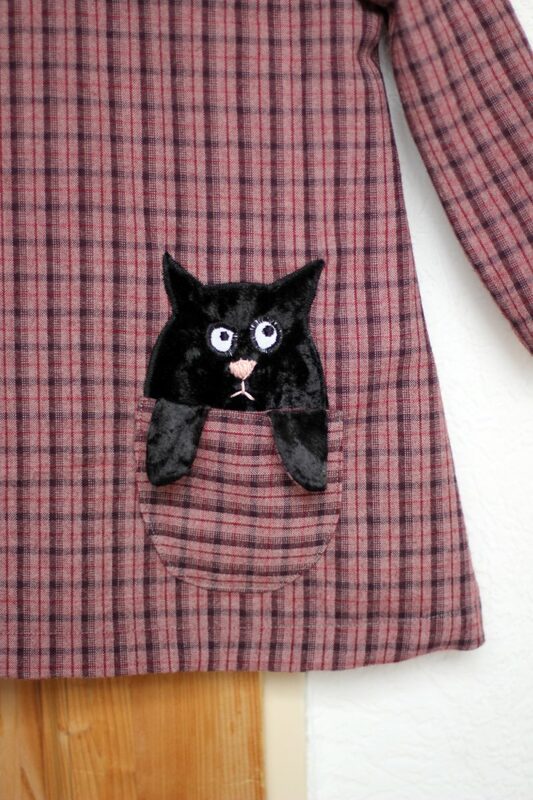 After assembling the pocket, I topstitched it onto the dress, covering the bottom of the weirdly egg-shaped cat! The collar was made pretty similarly. 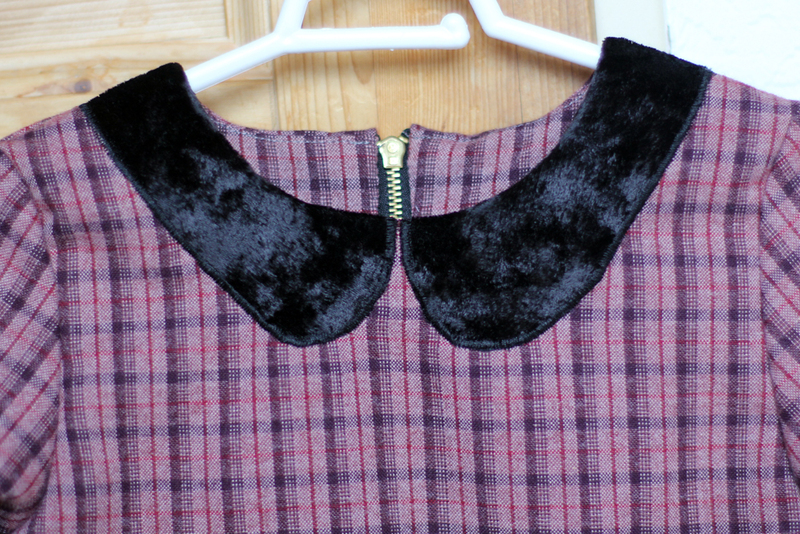 I appliqued the velvet collar to the front of the dress, before assembling the dress. This way I could simply finish the raw edge at the neckline by facing it. The pattern is a toddler dress pattern from LA MAISON VICTOR, that I adapted quite a bit. I’ve made another dress using the unchanged, original pattern which I’ll review on the blog soon. I love how this little dress turned out. I feel the combination of pink tartan, black velvet and the golden zip give it quite a cool, grungy look. I’d love to have one in my size! How do you feel about sewing for others? Do you enjoy making kids clothes? A very cute dress for a very, very cute girl! That is so adorable!!! I can’t wait until I have (hopefully!) a granddaughter to sew for! I loved sewing for my daughter up and through her wedding gown!